Serve this roasted butternut squash with its gorgeous caramelized crust as a side dish or to create salads, soups, and even desserts. Oh, how I love to roast veggies! The high heat seems to have a magical effect as it intensifies the flavors and creates that sweet, crispy, brown crust. So magical! 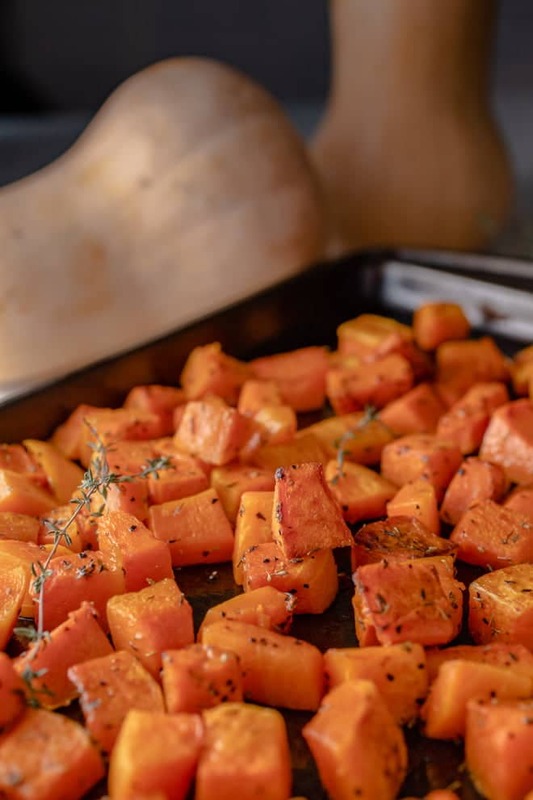 I roast lots of different veggies all season long, but I have to admit that I get very excited when butternut squash is plentiful in grocery stores in the fall and winter. If you have an aversion to roasting butternut squash because you hate to peel them, there is a very simple solution. Microwave it first. The steam created during microwaving loosens the skin making peeling a cinch. Slice 1/4” from the top and bottom of the squash, poke the skin with a fork – about 20 times. Make sure that you poke holes all the way around the squash. Microwave on high for 3 1/2 – 4 minutes. Allow the squash to cool so you don’t burn your hands and then use a vegetable peeler or paring knife to remove the skin. If you’d like to watch the process, here is a great Youtube video. In addition to the microwave peeling hack, I have four other tips for perfectly roasted squash. First, I arrange the squash in a single layer on the baking sheet. Second, I roast at a high heat to ensure that it doesn’t steam into an unappetizing mush. Third, I don’t skimp on the oil. It creates a beautiful color, adds flavor, and minimizes the tendency of the squash to stick to the pan. Two tablespoons of oil for a 3-pound squash is about right. And lastly, I roast the squash on the lowest rack as it is the hottest part of the oven and where the magic happens. This recipe can be served as a side dish straight from the oven or it can be refrigerated and used in so many different recipes. One of my favorite ways to use it is in a salad with fresh greens, candied pecans, a little goat cheese, and a balsamic vinaigrette, like this one. Now, I know that this is going to sound crazy, but you can also use any leftovers in desserts like this cookie recipe from Kate McDermott. 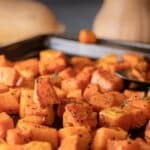 I hope you will roast up some butternut squash and enjoy it as a side dish, in a salad or even in a dessert. And yes, I still season it with salt and pepper if I am going to make the cookies. In a large bowl, toss the squash with the olive oil. Season with salt and pepper and any herbs if using. Spread the squash on a baking sheet in a single layer. Roast in the oven for 40 – 50 minutes turning the squash with a metal spatula halfway through the cooking time. The squash is done when fork tender and nicely browned. Experiment with herbs like thyme, rosemary or sage to change up the flavors of the side dish.